This was the quarter when investors were reminded that stocks don't go up forever. The euphoria that carried the market higher and higher last year came to an end during the first months of 2018. 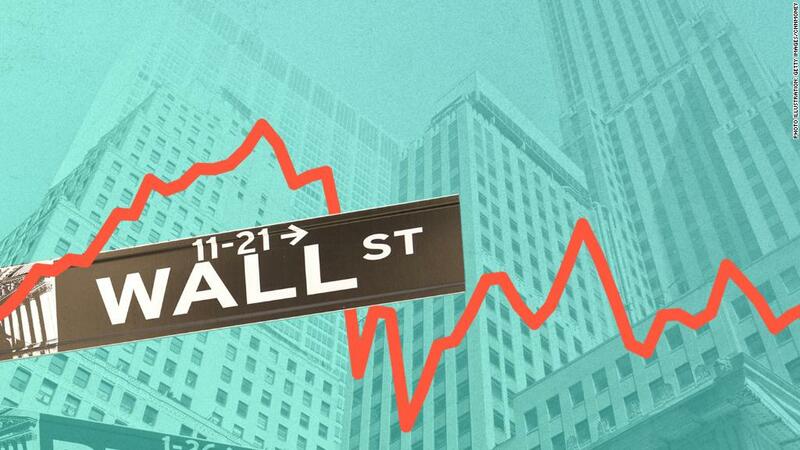 It was an extremely turbulent quarter that featured two 1,000-point Dow plunges, powerful rallies and a growing list of fears for investors. "Things were so placid in 2017. We don't expect it to be as smooth going forward," said Mike Loewengart, vice president of investment strategy at E*Trade. Wall Street started the year with a boom, as the Dow crossed 25,000 and then 26,000 in the span of just seven trading days. Investors were overjoyed about President Trump's corporate tax cuts and expectations that growth would accelerate. But the Dow is ending the first quarter about 2,500 points, or 9%, below its all-time high on January 26. That was the Dow's 99th record closing high since Trump's election, and the century mark seemed just around the corner. Just a week later, a sudden jump in wage growth raised the specter of inflation and rattled the bond market. The Dow plunged by an eerie 666 points that day. Even though inflation has since receded as a major concern, Wall Street has been rocked by a range of other worries that seem to ebb and flow with the headlines. Trump's crackdown on trade, first with aluminum and steel tariffs and then with threats against China, unnerved Wall Street. Trade war fears have since eased a bit as Trump has softened his stance and hopes have risen for a resolution with Beijing. 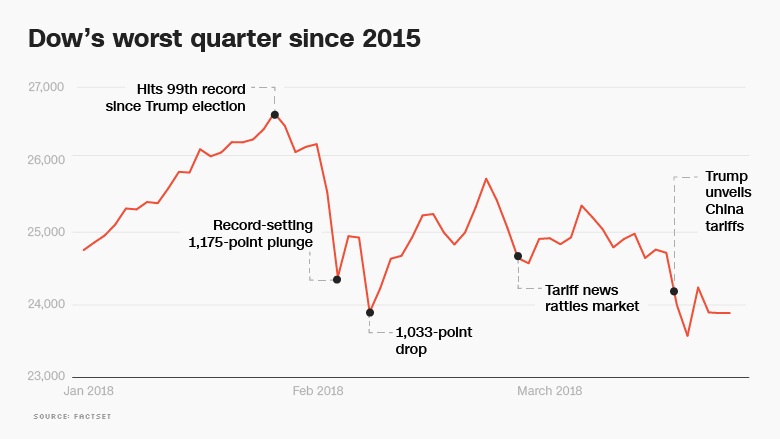 "With tariffs, there is a lot of bark, but there's not much bite," said David Kelly, chief global strategist at JPMorgan Funds. The tech world, once a reliable source of strength, has faltered. Facebook (FB) tumbled into a bear market as a data crisis consumed one of America's most widely held companies. Other former tech darlings like Tesla (TSLA) and Alphabet (GOOGL), the parent company of Google, have fallen sharply from their all-time highs. Even Amazon (AMZN) is under pressure, thanks to attacks from Trump. Kelly said the pressure on tech reflects investors' desire to avoid the most expensive areas of the stock market, just in case this slump turns into something deeper. "People don't want to get caught in a bubble market," he said. Despite the tech trouble, the Nasdaq advanced 2% for the quarter, extending its win streak to seven. Related: Is tech wreck for Amazon and Facebook over or just beginning? Wall Street has bounced from concern to concern lately. But the volatility also shows that investors are adjusting to a vastly different world from a few years ago. Congress is stimulating the already healthy economy with a rush of spending and huge corporate tax cuts, just as the Federal Reserve is tapping the brakes on growth by raising interest rates. The collision of those powerful forces was bound to create some turbulence. "Those are the waves," Kelly said of the focus on inflation, tariffs and tech. "But the real issue is the rising tide of interest rates." Of course, it hasn't just been Wall Street encountering an air pocket this year. Britain's stock market has plunged 8% this year, and stocks in Germany and Ireland have tumbled 6%. Asian markets have also lost ground, including sharp falls in China and Japan. "I'm amazed at all the doom and gloom," Michael Block, chief strategist at Rhino Trading Partners, said in a report. "After years of whining about the lack of volatility, market players suddenly have more volatility than they can handle." Despite the market turmoil, the fundamental outlook looks bright. Forecasters expect corporate profits and economic growth to accelerate, thanks in part to the help from Washington. "GDP is growing. People have jobs. Things look pretty good overall," Loewengart said. That's why some think the market is enduring a temporary storm that will clear the way for new record highs later this year. "We were way overdue. This is a normal correction that's part of a longer-term uptrend," said Mary Ann Bartels, head of portfolio strategy at Merrill Lynch Wealth Management. Merrill Lynch believes strong corporate earnings will carry the S&P 500 to 3,000 later this year, a 14% leap from today. JPMorgan's Kelly doesn't see a bear market so long as the economy keeps chugging along. And he isn't worried about a recession over the next 18 months. But he warned that the market could encounter trouble in 2019 and 2020 as the economy slows, wages accelerate and borrowing costs rise.